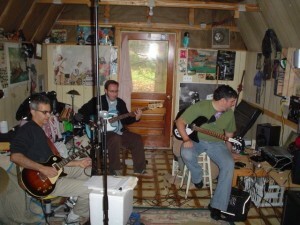 Java, Joe Kelly and Dominic jamming at JavaFest in late 2008 in the shack rich in pop culture located in bucolic Sewell, N.J. Host Tom Hannon snapped this from behind his drum set during our super fun jam. We recorded a bunch of songs on Dom’s computer and we totally rocked out. Some day the tunes may be mixed, but who cares, I loved it. These guys are all really amazing and I’m totally stoked that they stil put up with me.